Landessieger - Baden & Bavaria in 1977. Nordic Sieger in 1975, 1976 & 1977. Norwegian Sieger in 1976 & 1977. Guys Hilo vom Norden Stamm passed the ZTP with 1A rating for character and V for conformation and won 'High In Trial' at the yearly Police Dog Trials in Lüneburg, Germany in 1977. He passed the Schutzhund III examination at seven years of age but failed at the Körung. He was also a multi-Champion and multi-Sieger dog. Guys Hilo lived to 9 years of age and died from stomach torsion. “This black male came from Norway to Germany at the age of five. He was a very elegant male, with a compact build. 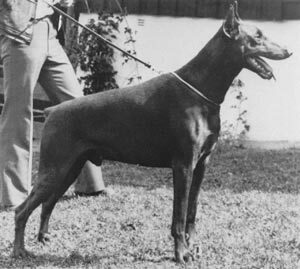 Mr Schellmann a Dobermann judge and breeder wrote of him: “a well-built Dobermann, his back is firm but his croup could be better. His head is very good but could do with a stronger under-jaw, dark eyes and good dark markings. The fore and hindquarters are correct and his movement is O.K.". Kim: SchH 3 and dam of the vom Reuschenberg “A, B” litter (Aschra, Brista). Orpheus: SchH 3 and passed the Körung 'for life' with Körklasse 1A rating. He is sire of the vom Wilden Markgraf “K” litter (Kessy); vom Druidenstein “R” litter (Rex Rocco) and von Nymphenburg “F” litter (Feus, Ferice). Nimrod Hilo: SchH 3 and sire of the van Stokebrand “B, C” litters (Björn) and vom Franckenhorst “V” litter (Vincent, Vitesse, Vivre Vivien). Caecilius: SchH 1 plus winner of numerous show titles and sire of the van Diaspora “F” litter (Fabiana Fusciana). Xira: SchH 1 and passed the Körung 'for life' with Körklasse 1A rating. She is dam of the von Frankenland “C” litter (Castra). Iris: dam of the vom Kennersberg “B, C” litters (Bronco). Briska: passed the Körung in Sweden, was a Swedish Obedience Champion and winner of numerous show titles. She is dam of Briska's "A, B" litters (Adam, BriBinna).